Jim Harbaugh is competitive (LINK). Bradenton (FL) IMG Academy defensive end/linebacker Rahshaun Smith decommitted from Clemson. Smith is a 6'3", 239 lb. prospect who is high on Auburn, LSU, Maryland, and Miami, among others. He's a 247 Composite 4-star, the #1 inside linebacker, and #55 overall. He transferred from the Baltimore area to IMG Academy after his junior season, and he expressed interest in Michigan when he was first offered. However, I do not think the Wolverines will factor back into his recruitment. Covington (GA) Newton running back Kurt Taylor was offered by Michigan. He's a 5'9", 200 lb. prospect with offers from Cincinnati, Kentucky, Rutgers, and Vanderbilt, among others. He's a 247 Composite 3-star, the #34 running back, and #464 overall. He claims a 4.48 forty. Taylor is compact, strong, and built low to the ground. He can grind out tough yardage and bounce off some tackle attempts. He doesn't have great burst, but he's decisive and gets upfield quickly. He visited Michigan for the BBQ at the Big House and was offered after the trip. He plans to return for the Ohio State game in late November. Hit the jump for a new 2018 offer, several players who committed elsewhere, and some random bits. Angelique Chengelis has a piece on new strength and conditioning coordinator Kevin Tolbert (LINK). Hit the jump for some good looking ladies, including a gif of a woman coming down the stairs. Last year: I ranked Smith #21 and said he would be the starting running back with 150 carries, 700 yards, and 8 touchdowns. He made two starts with 108 carries for 519 yards and 6 touchdowns. Last season was another fairly disappointing year for Michigan's running game. Sprinkled throughout the year were some good games intermingled with some bad ones. Furthermore, no running back was consistently the best. If you ask three different people who the best running back was in 2014, you'll get three different answers. Smith earned his first career start against Michigan State after Derrick Green broke his collarbone and finished with 11 carries, 39 yards, and 1 touchdown. Statistically, his best two games were the opener against Appalachian State (8 carries, 115 yards, 2 touchdowns) and against Northwestern (18 carries, 121 yards, 1 touchdown). He also had some real stinkers, including six games in which he averaged 3.1 yards/carry or fewer. Toward the end of the year, Drake Johnson took over the starting gig and looked superior to Smith. The battle rages on to be the starting running back at Michigan. Justice Hayes was a third down back, but he opted to spend his fifth year at Southern Miss. Drake Johnson looked solid at the end of the year, but he tore his ACL in the season finale against Ohio State. Green was the leading rusher for most of last season, but he had that broken collarbone and isn't the most instinctive runner. Ty Isaac sat out last year after transferring from USC, and lineman Kyle Kalis recently said that the line couldn't wait to get Isaac on the field after watching him bruise people up in practices last year. Karan Higdon is an unknown quantity as an incoming freshman. 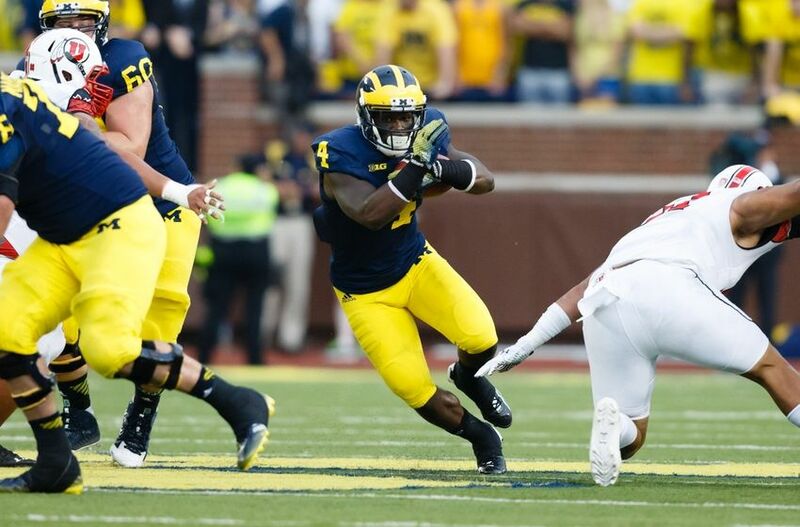 Angelique Chengelis has an article on the extremely under-the-radar Jabrill Peppers (LINK). Hit the jump for some beautiful ladies. Last year: O'Neill played for Weber State. He punted 62 times for 2,737 yards (44.1 yards/punt). The first of three graduate transfers to be ranked, O'Neill had the longest route to Michigan. Originally from Australia, he played Australian rules football and participated in the shot put to begin college in his home country. He ended up at Weber State in the 2014 season, where he averaged 44.1 yards/punt and was sixth in the Football Championship Subdivision. He also had a 23-yard run (Australian rules football, yay!) and a 17-yard pass (umm...shot put, yay?) to convert first downs on fakes. To put those punting numbers in perspective, that 44.1 yard average is behind only Zoltan Mesko in 2009 and Will Hagerup in 2012 over the past seven years. O'Neill has a big leg, but he also has a penchant for putting the ball inside the 20-yard line. Other than 2011, when Brady Hoke could do no wrong, Michigan has been very vanilla on special teams. O'Neill and new special teams coordinator John Baxter should usher in some fresh ideas and a more modern approach to the punting unit. The combination of the two should give Michigan one of the top two or three punting units in the Big Ten. O'Neill should be backed up by redshirt junior Kenny Allen, whom I ranked near the bottom of the countdown simply because punters don't often suffer injuries. It's Friday night, so enjoy some beautiful ladies to begin your weekend, including SI swimsuit model Hannah Davis celebrating 'Merica. John U. Bacon posted a piece on Jim Harbaugh's effect in the Big Ten (LINK). Last year: I ranked Mone #52 and said he would be a backup nose tackle. He made one start and had 9 tackles, 1.5 tackles for loss, and 1 fumble recovery. Mone played a fair amount last season as a backup. Michigan had depth on the interior defensive line, so he was not needed as much as some teams might have needed a huge, freshman, 4-star defensive tackle. His one start came mid-season against Penn State, and he came away with a fumble recovery and a tackle for loss in the Indiana game. He was not outstanding, but he was not a liability, either. Worse things can be said about true freshman defensive tackles. One guy standing in his way last year was Ondre Pipkins, who has since transferred to Texas Tech. Mone will now be competing mostly with incumbent starter Ryan Glasgow for snaps at the nose, perhaps with a little Willie Henry or Maurice Hurst, Jr. tossed in there. Glasgow has shown to be a solid space eater, but has not done much in the way of penetration or big plays. Mone is the second-heaviest player on the roster behind Ben Braden (331 lbs. ), and with some work in the weight room this off-season, he should be even more ready to go for the upcoming year. While Glasgow is more consistent, I like Mone's explosiveness and have him ranked ahead of the incumbent. There is frequent rotation on the defensive line, so both will get plenty of snaps, and I think Mone will make his presence felt this year. at the 2013 U.S. Army All-American Bowl. Redshirt sophomore offensive lineman Chris Fox has called it quits after dealing with injuries over the past few years. A product of the class of 2013, he tore his ACL near the end of his senior season and has not been the same since. Listed at 6'6" and 303 lbs., he could never get back into great playing shape. He played in just one game during his career, which was last year's season opening demolition of Appalachian State. He will remain with the program as a student assistant while finishing out his undergrad career. After committing to Michigan in February of 2012 (LINK), Fox was on his way to playing in the U.S. Army All-American Bowl as a high school senior but could not participate. As we have also seen with Ondre Pipkins, ACL tears for big guys can be very damaging. Fox was a 247 Composite 4-star, the #9 offensive guard, and #110 overall in 2013. Believe it or not, he was just Michigan's seventh-highest ranked recruit behind Derrick Green, Patrick Kugler, Dymonte Thomas, Shane Morris, Kyle Bosch, and David Dawson. Michigan took six linemen and 27 total players in the 2013 class. Two of the linemen (Fox and Kyle Bosch) have left the program, and three total players (toss in wide receiver Csont'e York) have departed for various reasons. Fox's departure, which I had been expecting since the spring, is the second of the two medical hardships I had previously mentioned; the other was Pipkins, whose transfer to Texas Tech apparently goes against the grain of Michigan's medical staff, who thought he should probably hang up the cleats. There are still other players who will probably not be on the fall roster, although all but Dennis Norfleet have been listed on Michigan's summer camp roster. The loss of Fox is also a reason that Michigan is looking to take such a large offensive line class in 2016. With Ben Bredeson, Devery Hamilton, Michael Onwenu, and Erik Swenson already in the fold, the Wolverines could potentially still take two more linemen in this class. You'll never guess who is one of college football's most intriguing coaches (LINK). Last year: I did not rank Seychel. He did not play. When it comes to kicking, punting, and long snapping, I am by no means an expert. I can coach them a little bit, but figuring out whether a player has potential or not is best left to others. This is an especially tricky ranking in a year when the specialists over the last four to five years both disappeared at once: Will Hagerup was the primary punter for four of the past five years, and Matt Wile was a kickoff specialist for his entire career, plus being the full-time placekicker last year and part-time before that. The only kicker or punter on the roster who has seen game action at all is redshirt junior Kenny Allen, who has worked as a holder and also punted one time in the 2013 season opener. That's where Kyle Seychel steps in. I have heard that he had a good spring, and the coaching staff trusts him going into the 2015 regular season. They appear to think that he will be their starting kicker this year, and he was the guy they sent in to kick the extra point in the spring game. As a class of 2014 prospect, Kornblue Kicking liked him and said he has NFL potential (LINK). During his senior year at Hartland, he averaged 42.8 yards a punt and made 6/8 field goals, including a 49-yarder (LINK). Also, 10 of his 12 recorded kickoffs went for touchbacks. Other options include Allen, freshman scholarship kicker Andrew David, and freshman walk-on Ryan Tice. Let the best man win. Here's an article on how and why Jake Rudock ended up at Michigan (LINK). Last year: I ranked Glasgow #54 and said he would be a backup nose tackle. He started eleven games and made 22 tackles, 4 tackles for loss, 1 forced fumble, and 1 fumble recovery. I underestimated Glasgow last year. He made just 2 tackles in extended time in 2013, and he basically just held his ground at the point of attack or got washed out. I didn't see a reason to place him higher than about midway through the countdown. Somewhere between the end of 2013 and the beginning of 2014, he figured out how to play football in the Big Ten. He was not a superstar last year, but he was strong at the point of attack and got some penetration for a defense that was pretty good. The highlight for him came against Indiana when he poked the ball out and recovered the fumble. It was good to see him take a step in the right direction with two years left to play. Now Glasgow is a veteran starter in the middle of a good defensive line. I have underestimated him before, but my guess is that he will continue to be solid against the run and not much of a pass rusher. He can hold up against double-teams in the middle, and he can beat one-on-one blocks with some regularity. While I expect him to start at least part-time, Michigan is so deep on the interior defensive line that I do not see Glasgow as being irreplaceable. The Wolverines have a few capable nose tackles in Glasgow, Bryan Mone, and Will Henry, not to mention someone like Maurice Hurst, Jr. who can play in passing situations. ESPN is doing a ranking of the top 100 players in college football, and somehow Jabrill Peppers made the list at #69 (LINK). 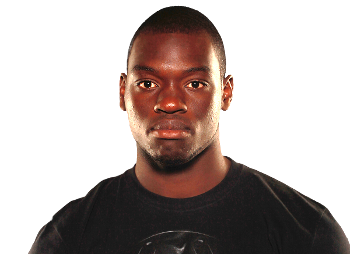 Mario Ojemudia was the lone participant in the inaugural Semper Fi game. Last year: I ranked Sypniewski #32 and said he would be the starting long snapper. He started all twelve games at long snapper. I would be fibbing if I told you that long snapper scuttlebutt abounds. The average Michigan fan probably couldn't tell you the name of Michigan's long snapper last year, and that's probably a good thing. I vaguely remember a lone questionable snap on a field goal attempt last season, but it was just a little low and those types of things tend not to make the news. I can say from personal experience that having poor play from a long snapper is extremely damaging to a team and can change a lot of game strategy, so minimizing mistakes is a huge deal. With a new, dedicated special teams coach, I would expect Sypniewski to remain solid. The lone backup long snapper listed on the roster is Andrew Robinson, a redshirt freshman walk-on from Troy (MI) Athens, but tight ends and linebacker types have often dabbled in the long snapping arts. DraftInsider.net scouts out the Big Ten (LINK). Michigan has nobody projected to go in the first couple rounds. Last year: I ranked Hill #31 and said he would be a backup safety. He made five starts with 20 tackles and 1 fumble recovery. It's hard to believe that Hill is already a junior. Much like Ben Gedeon, he seemed like a guy who could use a redshirt year to acclimate to the college game and then make an impact down the road. But last year indeed, he was a true sophomore who played a good chunk of time in the revolving door at safety. Five players made starts at the two safety positions, and injuries were not a major problem except in the case of Jarrod Wilson. The coaching staff simply didn't see anyone separating himself. Hill had an okay year but never stood out as a player, and his biggest impact came when he recovered a fumble against Michigan State. Jabrill Peppers has moved to safety, and people are pointing to him as the quarterback and potential star of the defense. Unfortunately for Hill, they play roughly the same position. With Wilson starting at one safety and Peppers at the other, Hill should be a sub in nickel packages when Peppers bumps down to slot corner. Michigan will probably spend more than a third of their defensive snaps in the nickel, so Hill should get another big chunk of playing time. The word on Hill is that he's a very good athlete, but I have never seen great instincts or playmaking ability on his part, even when he was in high school. He should have plenty of chances to change our minds this year. Upper Marlboro (MD) Riverdale Baptist cornerback Sir Patrick Scott committed to Michigan (LINK). Dallas (TX) South Oak Cliff running back Jordan Stevenson was not admitted to Wisconsin, so he became a "free agent" over the last couple weeks. Wisconsin's stringent admissions standards were reportedly a big reason why head coach Gary Anderson left town for Oregon State in the off-season, and perhaps Stevenson was a casualty of that system. It's not clear whether Michigan offered him or not, although there was word the coaching staff would be in contact. Regardless, he went ahead and committed to Nebraska, so he will still be wearing red and white in the Big Ten. New Orleans (LA) Riverdale defensive tackle Tyrus Butler was offered by Michigan. He's a 6'2", 300 lb. prospect with offers from Mississippi State and Tulane, among others. He's a 247 Composite 3-star, the #114 defensive tackle, and #1893 overall. As a junior in 2014, he had 67 tackles, 30 tackles for loss, and 9 sacks. New offers to defensive tackles may mean that the coaches don't want to put all their eggs in the Rashan Gary basket. 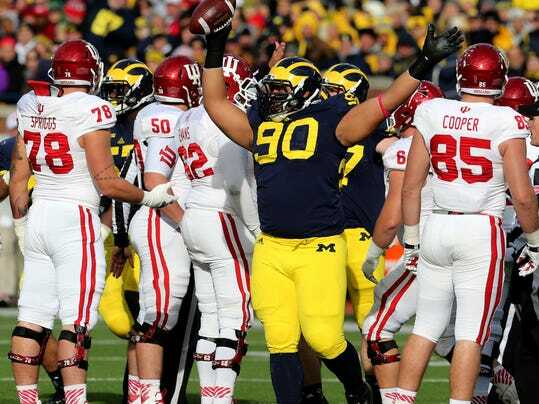 Amarillo (TX) Amarillo defensive tackle Ivory Jackson was offered by Michigan. He's a 6'3", 275 lb. prospect who committed to Texas Tech in early June; he also has offers from Kansas and Kansas State, among others. He's a 247 Composite 3-star, the #88 defensive tackle, and #1513 overall. As a junior in 2014, he made 74 tackles and 6 sacks. Bradenton (FL) IMG Academy tight end Isaac Nauta decommitted from Florida State. Michigan has always been in his top group, and he has maintained that he will take an official visit to Ann Arbor, so this would seem like a good thing for the Wolverines. However, he is expected to commit to Georgia, which is where he played high school ball before transferring to IMG Academy in the off-season. And in even more damaging news, now the Seminoles are looking for a tight end, which might push them ahead of Michigan for Philadelphia (PA) Imhotep tight end Naseir Upshur, who had been thought of as a Michigan lean. Upshur has since postponed his announcement date of August 8th. Hit the jump for a couple new 2018 offers, some guys who went off the board, and some random bits. Upper Marlboro (MD) Riverdale Baptist cornerback Sir Patrick Scott committed to Michigan on Sunday at the BBQ at the Big House. He chose the Wolverines over offers from Arizona, Kentucky, Michigan State, Pitt, Wake Forest, and Wisconsin, among others. Scott is a 6'1", 175 lb. prospect. Scott came to Sound Mind Sound Body in Detroit, and he attended Michigan's summer camp. Shortly afterward, he was extended an offer by the staff. 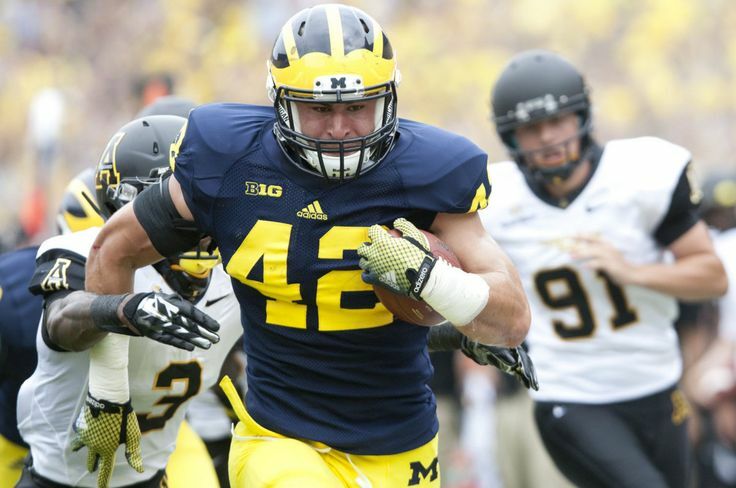 The Wolverines jumped to the top of his list, and overtook the Wake Forest Demon Deacons. He set a visit for the BBQ, but it had been unclear if he would have a chance to commit before some other players got to the spot first. Scott is a physical corner. He has long arms, and he does a good job of jamming receivers at the line of scrimmage. He also does a good job of flipping his hips, turning to run, and tracking the ball in the air. He is not a big hitter, but he tackles well and plays fundamentally by holding outside contain. He tackles low and wraps up nicely. Scott's athleticism is somewhat lacking, however. He does not change direction well, he takes some time to get up to top speed, and he does not have great makeup speed. There are a lot of "almost" plays on his highlight reel, and in college, I'm afraid the plays he is "almost" good enough to make in high school will turn into big plays for Big Ten opponents. I am not enamored with Scott, but that is partly because I want the Wolverines to pull in a dynamic playmaker at the cornerback position. Especially with Jabrill Peppers playing safety, there is basically no heir to Jourdan Lewis's throne as a true cover corner. I think the Wolverines are getting a lot of mid-level guys who are big and physical, but perhaps that's not the best way to go in college. I think boundary corners are pretty easy to find, whereas field corners are rare. Michigan now has 22 commits in the 2016 class, including three corners: Scott, Floridian Antwaine Richardson, and Canadian Benjamin St-Juste (who could reclassify to 2017). All three seem to be boundary guys or perhaps safeties. They will probably continue to look for a true cover corner in the class, and I assume they're done with boundary types. Nick Baumgardner talks about Ty Isaac (LINK). It may be noteworthy to a certain reader that Harbaugh says he only practiced for "a day" in the spring due to injury. Michigan's coaching staff will be holding the annual BBQ at the Big House on August 2, 2015. The tradition was started by Rich Rodriguez and has normally been held in July, so this is a later date than normal. It could get interesting seeing how many players can travel from a long distance, because high school football practices usually begin at the start of August. Regardless, there are several players scheduled to attend, including a posse from Maryland and the New Jersey area. Ben Bredeson - OT - Hartland (WI) Arrowhead: Bredeson committed to Michigan in June (LINK). 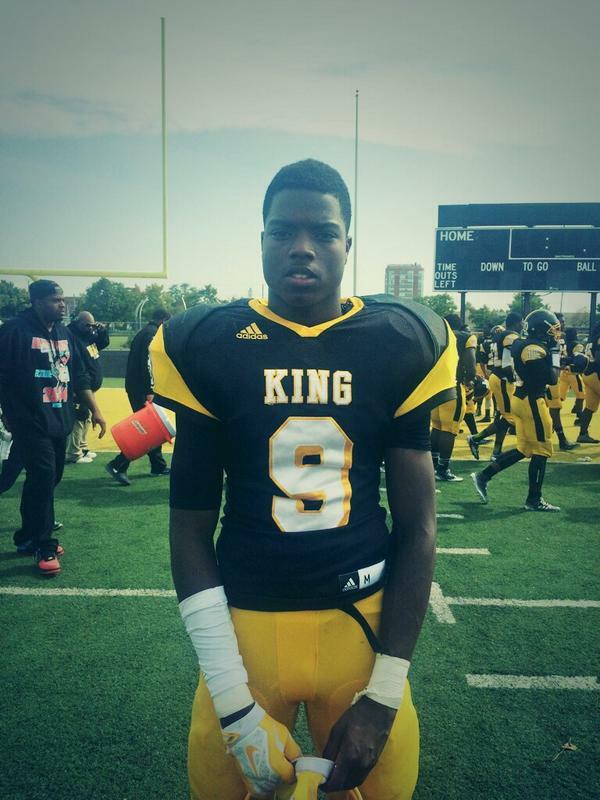 Donnie Corley - WR - Detroit (MI) King: Corley is a 6'2", 180 lb. prospect with offers from Alabama, Michigan, Michigan State, Ohio State, Tennessee, and USC, among others. He's a 247 Composite 4-star, the #18 wide receiver, and #114 overall. Reports differ on how seriously he is considering Michigan, but Michigan State and Tennessee seem to be high on his list. Terrance Davis - OG - Hyattsville (MD) DeMatha: Davis is a 6'4", 305 lb. prospect with offers from Alabama, Florida, Florida State, Georgia, Maryland, and Michigan, among others. He's a 247 Composite 4-star, the #2 offensive guard, and #76 overall. He has been rumored to be a silent commit to Michigan, but Maryland and others are in the mix. UPDATE: Davis did not make it to Ann Arbor. Hit the jump for several more prospects, including kids all the way through the class of 2019. Last year: I ranked Gedeon #38 and said he would make 30 tackles and 1 sack as a backup linebacker. He made 17 tackles, 1.5 tackles for loss, and 1 sack; plus he returned a blocked punt for a 32-yard touchdown. Gedeon is one of those players who is hitting his later years on campus with fans thinking, "Huh? How is this guy so old already?" Despite not being needed, he played immediately as a freshman in 2013, making 19 tackles and 1 sack. The same sort of role recurred in 2014 when he made 17 tackles and 1 sack. Michigan had several more proven, more experienced guys ahead of him, but he played in all but one game during his first two years. His most impressive play of last season came when fellow linebacker Mike McCray blocked a punt; Gedeon corralled it, showed off his high school running back skills, and found the goal line 32 yards later. Gedeon's a junior now, and he is arguably the best athlete in the linebacker corps. He has been pretty good when he gets playing time, but the path to the field is blocked by seniors Desmond Morgan, Joe Bolden, and James Ross. Gedeon will probably be the first linebacker to sub in, and an injury would likely give him a starting job. He has good size, speed, and instincts. Additionally, despite never being a starter, Gedeon is quite possibly the spearhead of the 2016 linebacker group, if not the entire defense. He has been a role player the past two seasons, but he should get more of a chance to shine this year. 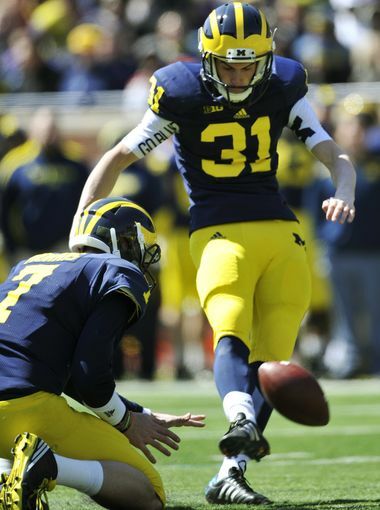 Nick Baumgardner previews Michigan's special teams (LINK). Last year: I ranked Kugler #75 and said he would be a backup center. He played in one game. Kugler has not lived up to the expectations some people had for him coming out of high school. A highly ranked player, the son of an NFL offensive line coach (and now the head coach at UTEP), Kugler was expected to compete for playing time very early on an offensive line that was not very productive. Some thought he would play as a true freshman or beat out Jack Miller as a redshirt freshman. Instead, he has never been higher than the third-string guy, and the one game he played last season was when part-time center Graham Glasgow was suspended. Whether we like it or not, Kugler is a key backup this season. The Wolverines have not done a great job of recruiting the center position in recent years. It's perhaps the most important position on the offensive line, so it's dangerous to ignore. The danger level rose a bit this offseason when Jack Miller, who would have been a fifth year senior in 2015, chose to leave the program. He had been the starter for all of 2014 and part of 2013, and he had been a solid contributor. In steps Glasgow, who played center quite a bit in 2013 but spent most of his time at left guard last year. Glasgow ran into some more legal trouble this offseason, and I don't know if he can be counted on to be available for an entire season. The coaching staff tried left tackle Mason Cole at center this spring, but his snaps were very inconsistent. Backup interior lineman Blake Bars has also snapped the ball a little bit, but he can get overpowered and does not maintain leverage well. If anything happens to Glasgow, the easiest thing will be to insert Kugler, but he has a lot to prove. It's Saturday morning, so enjoy some pictures of beautiful women, including a gif of a weather girl. Nick Baumgardner previews the defensive backs (LINK).